I really like my Yaesu FT1D HT. I think it has a good integration of 2m/70cm radio and APRS functions. However, every now and again I find myself forgetting where a certain feature is hidden among the rather complex Yaesu menu system. There is nothing more frustrating than spending 10 minutes trying to find some APRS messaging function you know you’ve used before only to find it is buried under some other menu system hidden away in the radio. Short of using the radio everyday, it is easy to become lost navigating some of the less used features. 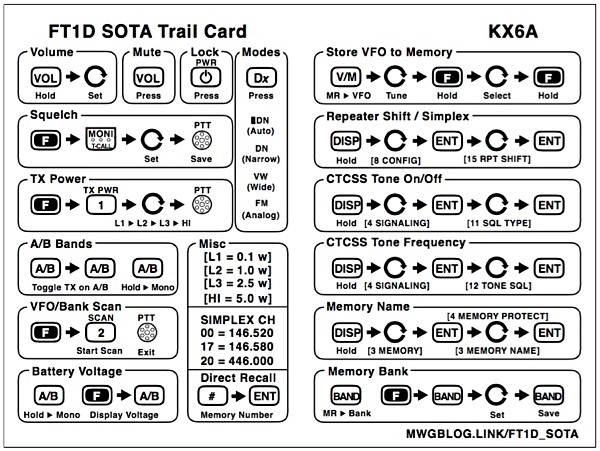 A few months back I saw that Dave Ek NKØE had put together a Trail Reference (read: cheat sheet) for his VX- 8GR. I really liked Dave’s layout and using that as a starting point I set about figuring out how to make one of my own for the FT1D. 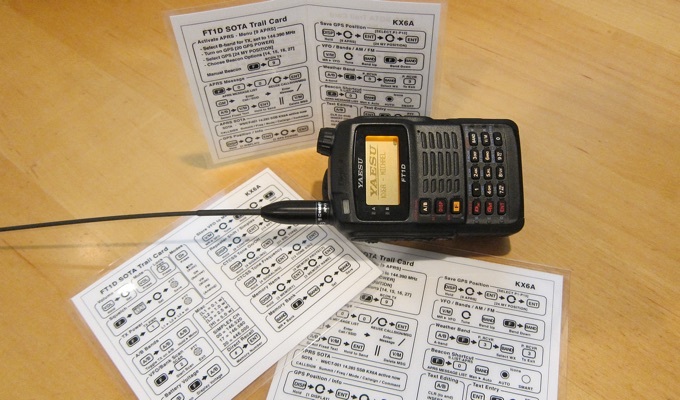 The FT1D SOTA Trail Card is not a comprehensive FT1D operating overview but contains features, functions and information that suits how I use my FT1D in the field. 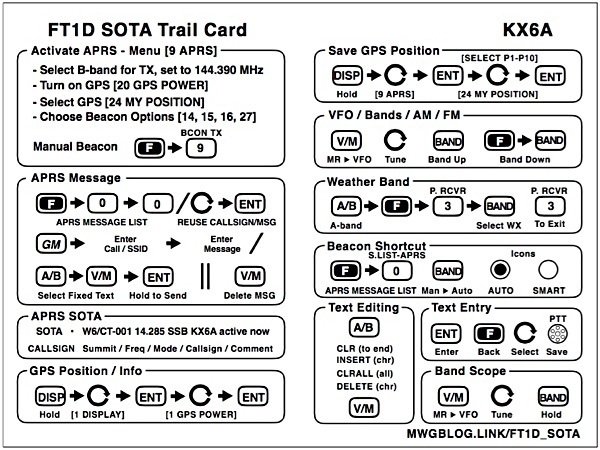 For example, one of the aspects unique to the trail card is information specific to using the APRS2SOTA self spotting system. I thought I’d go ahead and post it with the hopes that it may be of use to others. If you find it useful, you are welcome to it. I’ve provided both a PDF version to print and a jpeg images in the post you can save on your mobile device. The trick to the PDF version is to print the FT1D SOTA Trail Card duplex (double sided) using short edge binding. That way it lines up and you can cut and laminate it so that it is a bit more durable out in the field. These instruction should work for the Yaesu: FT1DR, FT1DE, FT1XDR and the FT1XDE. I am an avid SOTA (Summits on the Air) activator and chaser who holds an Extra class license. I enjoy peak bagging with my sons N6NGG and N6WMG. Fantastic! I also use an FT-1D on my SOTA activations and I frequently struggle to remember how to activate or change a certain feature or display. I got the FT-1D for APRS and the ability to post a spot to SOTAWatch using the radio. Your chart will come in very handy! Thanks! I’m glad you found it useful. Thanks for the comment. AWESOME! Thanks for the info, just getting into SOTA.. and just picked up the FT1XD to replace my VX8GR!! Thanks again! One question… what is the antenna on your HT in the picture? Looks good and flexible but like it would not get damaged easy. Thanks again..